Darcy St. James returns to Alaska to join a journalist friend undercover on the trail of a big story. But when Darcy arrives, she finds her friend has disappeared. Troubled by the cruise ship's vague explanation, Darcy uses her cover as a travel reporter to investigate further. The last person Gage McKenna expects to see during his summer aboard a cruise ship leading adventure excursions is Darcy. And in typical Darcy fashion, she's digging up more trouble. He'd love to just forget her--but something won't let him. And he can't help but worry about her as they are heading into more remote regions of Alaska and eventually into foreign waters. Something sinister is going on, and the deeper they push, the more Gage fears they've only discovered the tip of the iceberg. I have been itching to read Stranded, the third book in the Alaskan Courage series, for a while, but others books had to take the forefront. Thankfully, I was able to sit down with it and dive in recently. All the reviews I have been reading about Dani's new book are spot on! Stranded was a thrilling read! I think it is my favorite so far. Stranded follows Darcy St. James as she jumps back into her old work as an investigative reporter. Darcy thought she had left that in her past, until her form partner and friend Abby called her up with a story, and a message laced with fear. Wanting to help her friend, Darcy heads back to Alaska, five months after leaving, to hop on a cruise ship as a reporter for the excursion adventures the ship offers. On the ship Darcy briefly sees her friend, before an emergency happens. A person has fallen overboard. Darcy searches for her friend, but can't find her. She fears her Abby is the one who fell overboard, but she can't get anyone to confirm it. The crew is tight-lipped. Darcy does find someone on the ship she wasn't expecting Gage McKenna. Gage hasn't seen Darcy since his brother's trial five months prior, but he is glad to see her. He quickly finds out what Darcy is up to and is drawn into the investigation. Gage does his best to help, but it isn't until his sisters' Piper and Kayden and Piper's fiancee, Landon, the deputy from Yancy, join the group that pieces start coming together. As Darcy searches for anything about her missing friend, she and McKenna's stumble on to something far worse then they could have ever expected! 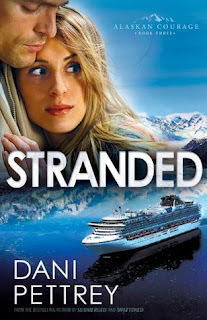 Stranded takes you on an exciting trip around the Aleutian Islands in Alaska on a ship that is full of dark secrets. When you think you might know what is going on, a twist takes you somewhere else and leads you down another path. I couldn't put this book down! It left me guessing and questioning everyone. Stranded also brought answers about a character I've been wondering about for sometime. I had a suspicion and I'm happy to say I was partly right! Not only did it bring answers about one character, but it answered a few other questions I was left wondering about at the end of Shattered. Stranded also left me wondering, what will happen next? I can't wait for the fourth story in the series, they keep getting better and better!